Pea Beverage: An Interesting Alternative? Although alternatives to milk are not lacking in grocery stores, and I wanted to talk to you about a new one today. Pea beverage caught my attention when we were looking for an alternative for our Low Carb High Fat meal plan. Indeed, it can provide plenty of nutrients, while at the same time being low-carb. 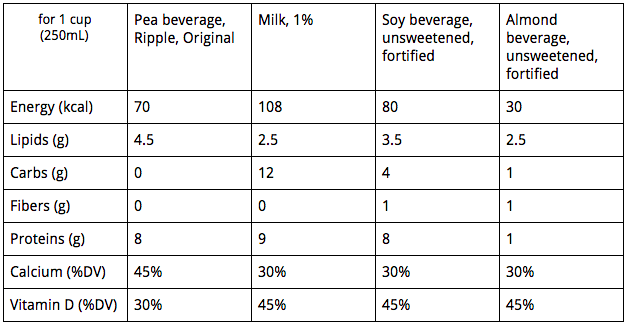 The manufacturing of pea beverage is not the same as for other plant-based milk alternatives. Traditionally, the main ingredient is soaked (almonds for almond milk, soybeans for soy milk, etc.) for a period of time, then blended and filtered. For the pea beverage, it’s a little different… The yellow pea protein is first extracted from the pea and then mixed with water. It is also for this reason that the pea beverage does not taste like… peas. This liquid is then mixed in with added vitamins and minerals. Some pea beverages are also made to be more creamy by adding oil (often sunflower oil) and an omega-3 blend that comes from seaweed. Pea beverage is an interesting alternative to milk or soy beverages from a protein point of view. In fact, for the same volume, the amount of protein is equal, which is ~8 g of protein per 1 cup (250 mL). Contrary to what one might think, pea beverage contains no carbs. This is explained by its production process, as explained above. 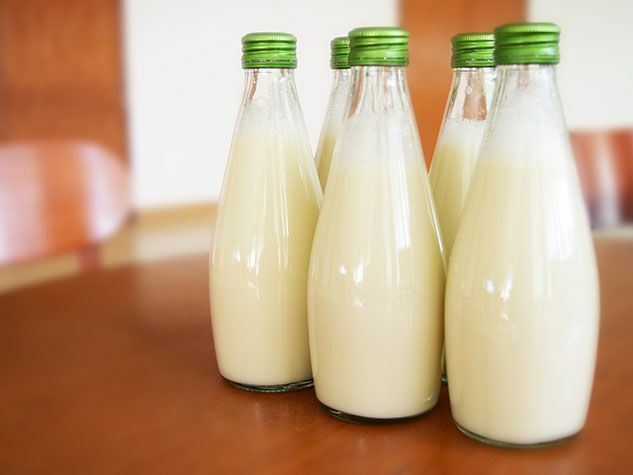 More often than not, pea beverages are fortified with calcium and vitamin D with values ​​comparable to milk and other fortified vegetable beverages. I invite you to take a look at the table above to see the comparative values. You should always check the label to make sure the plant-based beverage you buy is fortified. In summary, pea beverage can be a good choice for you if you do not consume dairy or soy, are looking for a way to include more calcium and protein into your diet without adding carbohydrates, or if you want to try something new!